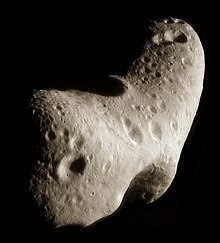 S-types asteroids, with an astronomical albedo of typically 0.20, are moderately bright and consist mainly of iron- and magnesium-silicates. They are dominant in the inner part of the asteroid belt within 2.2 AU, common in the central belt within about 3 AU, but become rare farther out. The largest is 15 Eunomia (about 330 km wide across its longest dimension), with the next largest members by diameter being 3 Juno, 29 Amphitrite, 532 Herculina and 7 Iris. These largest S-types are visible in 10x50 binoculars at most oppositions; the brightest, 7 Iris, can occasionally become brighter than +7.0, which is a higher magnitude than any asteroid except the unusually reflective 4 Vesta. Their spectrum has a moderately steep slope at wavelengths shorter than 0.7 micrometres (µm), and has moderate to weak absorption features around 1 µm and 2 µm. The 1 µm absorption is indicative of the presence of silicates (stony minerals). Often there is also a broad but shallow absorption feature centered near 0.63 µm. The composition of these asteroids is similar to a variety of stony meteorites which share similar spectral characteristics. Sa, Sk, Sl, Sq, and Sr-types containing transition objects between the core S-type and the A, K, L, Q, and R-types, respectively. The entire "S"-assemblage of asteroids is spectrally quite distinct from the carbonaceous C-group and the often metallic X-group. In the Tholen classification, the S-type is a very broad grouping which includes all the types in the SMASS S-group except for the A, Q, and R, which have particularly strong "stony" absorption features around 1 μm. ^ a b "Asteroid Lightcurve Database (README) – 2. Taxonomic Class, orbital class, and albedo". LCDB. Retrieved 16 February 2018. Bus, S. J.; Binzel, R. P. (2002). "Phase II of the Small Main-belt Asteroid Spectroscopy Survey: A feature-based taxonomy". Icarus. 158 (1): 146–177. Bibcode:2002Icar..158..146B. doi:10.1006/icar.2002.6856.